Definition: Gay Lussac’s Law describes the relationship between temperature (T) and Pressure (P) while number of moles (n) and volume (V) remain constant. 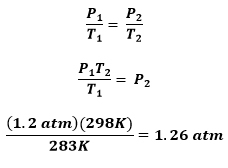 Relation: T and P are directly proportional so as temperature increases, pressure increases. Imagine you’ve just picked up a bunch of balloons for a party and you leave them in the car while running errands on a hot day. Since the balloons are sealed, the volume (V↔) is held constant so while the temperature inside the car increases (↑T) and gas naturally wants to expand (Boyle’s Law), it cannot. So the pressure inside the balloon increases (P↑) until it becomes too much and balloons pop. Looks like you have one more errands to re-run. True story! Problem: A sample of CO2 gas at 10°C has a pressure of 1.2 atm. What is the pressure when the temperature is increased to 25°C?